The V32 Optical Grade Extreme Compound is the first optical grade extreme compound designed with advanced technology to eliminate the most extreme paint defects and imperfections. V32 is developed for fast cutting capabilities utilizing optical grade micro abrasive technology to restore older paints and polish newly painted surfaces. The advanced compound is designed to cut through heavy paint imperfections for precision results. V32 is an ultra refined extreme compound designed to remove extreme paint defects while preparing the surface for the final steps of polishing. Formulated specifically for extended work time, V32 extreme compound is the first water-based OEM approved compound engineered to remove heavy paint imperfections and defects permanently from scratch-resistant and ceramic clear coat without filling in or covering up. Optical grade micro abrasives rapidly eliminate imperfections and remove 1200-1500 grit sanding scratches and swirls. V32 delivers fast cutting power with fewer passes to quickly restore your vehicle’s finish and is equally effective on both ceramic finishes and conventional clear coats.V32 delivers the finest results with unmatched optical clarity. Designed to function without oils, silicon’s or fillers, V32 maximizes efficiency by optimizing work time to deliver perfect results. Paint technology is one of fastest growing segments of the automotive industry. In the past several years, vehicle manufactures have begun to incorporate advancements in paint technology such as ceramic clear coat and water based paints to give owners the best possible paint coating that lasts longer than ever imagined. The new advancements in scratch-resistant and ceramic clear coats have changed the way professionals and enthusiasts maintain the integrity of their painted finish. Scratch-resistant and ceramic clear coats are designed to last much longer than conventional clear coat systems by resisting scratches and defects in most situations. New nano-ceramic clear coats make maintaining you vehicle’s painted finish easier, but can also become a difficult challenge when removing swirls, scratches, marring, and holograms. In order to give detailing professionals and enthusiasts the advantage when dealing with new ceramic clear coats and older neglected paints, we spent 3 years developing V32 to give the user the highest level of cutting power. 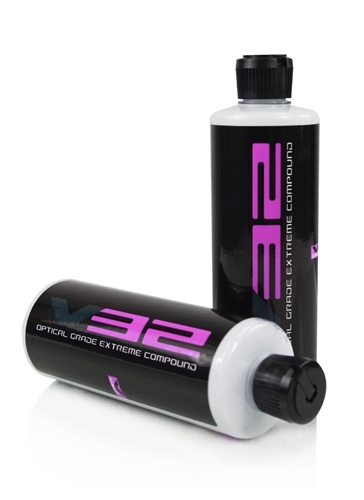 V32 is the first optical grade extreme compound designed to take paint correction to the next level. Engineered to function without oils or fillers, V32 extreme compound is the perfect choice for the detailing professional or enthusiast searching for unmatched optical clarity. V32 is designed for extended work time to deliver unmatched results with maximum efficiency on both scratch-resistant and ceramic clear coats while also being effective on conventional clear coat systems.